PARÍS (EFE). Excavaciones arqueológicas han llevado al descubrimiento de uno de los más antiguos barrios residenciales de la antigua Lutecia, el antecedente en la época romana de la actual París, informó ayer el diario vespertino Le Monde. Se trata concretamente de una calle de seis metros de longitud que estaba rodeada por cunetas y fue completada de manera progresiva durante la época romana con conductos y aceras. A un lado de la calle se han descubierto viviendas modestas que fueron edificadas con adobe sobre tierra batida y tienen techos de caña, precisa el rotativo. Barrio abandonado El barrio, que fue encontrado cerca de la actual calle Saint Jacques, en el parisiense barrio latino, data de la época del emperador Augusto, entre el año 27 antes de Cristo y el 14 de nuestra era. Su población se fue retirando de manera paulatina hasta su total abandono en el siglo III. Los expertos del Instituto Nacional de Investigaciones Arqueológicas Preventivas apenas han hallado mobiliario; sin embargo, se han recuperado unas cuantas fíbulas (especie de hebilla o broche antiguo que se usaba para sujetar las prendas de vestir) y algunas piezas de cerámica características del reinado de Augusto, que han permitido datar los diferentes niveles de ocupación de las viviendas. Los especialistas investigan ahora por qué el tramo recién descubierto no transita en paralelo a la vía principal del poblado, como sucedía habitualmente en los establecimientos romanos. *** Paris, ville antique (en francés) del ayuntamiento de París, permite visitar la ciudad romana de Lutecia (París) con bellas reconstrucciones infográficas, otras imágenes y explicaciones del acueducto, el anfiteatro-teatro, el teatro, el foro, las viviendas, las termas ... a la vez que da la posibilidad de realizar un recorrido por algunos aspectos de la vida cotidiana y por los restos presentes en la ciudad actual. 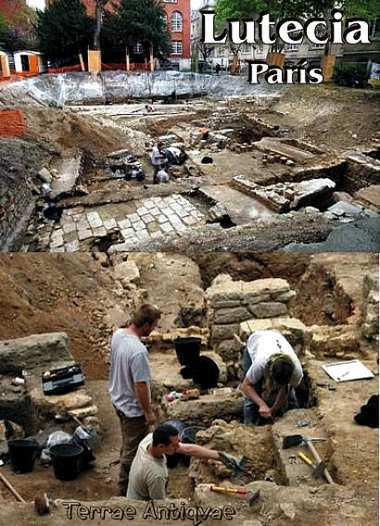 Archaeologists work last week at the site of ruins discovered at Rue Saint-Jacques in Paris. The remains of a road and several houses are believed to be 2,000 years old. PARIS  When the French look back, they generally trace the stirrings of national glory to Francois I in the mid-16th century or perhaps to Louis XIV 150 years later. And when Parisians look around, they see mainly the city reshaped into broad avenues by Baron Georges-Eugene Haussmann in the 19th century. Last week, they were reminded of a far earlier Paris, one that was still called Lutetia. On a Left Bank hillside, which carries the name of Sainte-Geneviève, the patron saint of Paris, French archaeologists have found remnants of a road and several houses dating back some 2,000 years to when Rome ruled Gaul. In one sense, it was not a surprise. Other Roman vestiges have been uncovered, notably those of a theater that could seat 15,000 and Roman thermal baths found beneath the 15th century Abbey of Cluny. Yet the area of the new find, a half-mile to the south, was so heavily built up in the early 20th century that it is hard to imagine space for excavation. In this case, however, the Pierre and Marie Curie University decided to replace a temporary structure with a research building. And, by law, construction in central Paris cannot begin until archaeologists have had a chance to investigate. They started digging early last month and almost immediately made one of their best finds in recent years. The Convent of the Visitation covered the 4,400-square-foot plot from the early 17th century until 1910, when it was demolished. One long-buried wall of the convent has been uncovered. Now quite visible is a road 20 feet wide, as well as the walls and floors of at least three houses. In one house, archaeologists have been able to identify an under-the-floor thermal heating system. And across the site, coins and ceramic shards have been found. Further, this area was inhabited long enough for stone walls to replace earlier clay-and-wood building material. The significance of such finds is what they reveal about earlier times. It is known that early settlers around the Île de la Cité burned their houses before they were conquered by a Roman legion under Labienus in 52 B.C. But in the decades that followed, a new town was built on the Left Bank, which eventually had a population of 12,000 to 20,000. Then, after the first barbarian incursions in A.D. 253, the population apparently withdrew from the hill of Sainte-Geneviève and sought refuge behind new walls on the Île de la Cité, which was called Paris, borrowing the name of the ancient Gallic Parisii tribe. Thus, because the archaeologists have found no traces of occupation of the site between the 4th and 17th centuries, they have been able to confirm that even an area little more than a mile from the Seine was long considered insecure for habitation. "It was a neighborhood of the Augustan period," said Didier Busson, the architect in charge of the dig. "It may have been founded by Gauls who had been in the Roman army and settled here, bringing with them their experience of building." Archaeologists have only until late June to complete their studies because, after that, construction will begin. But Busson is nonetheless satisfied with what has been achieved. "Thirty years ago, this site would have been destroyed even before we had a chance to excavate it," he said. "Maybe in 20 years it will be possible to preserve things as we find them."